As Patty Chang Anker approached her fortieth birthday, she realized that she was afraid. There were so many things that she was scared to do - go surfing, ride a bike, or tackle a high ropes course. She wanted to set a good example for her daughters and show them that fears are something that can be conquered. So Patty started a blog and set out to discover why we fear and how we can overcome our phobias. Patty writes a bit in Some Nerve about the transition from blog to book. Her initial efforts to face her fears were documented at her blog Facing Forty Upside Down. Maybe this is just my feeling about the publishing culture as a whole, but I find myself very wary of the whole "I had to start a blog and get so many followers so I could get a book deal" model. It seems gimmicky and while Anker, like other authors of this kind, is very relatable, I still feel like she was checking off prerequisites to be published instead of working from a burning desire to share a story. The fears that Patty confronts are ones that can be faced head on - she takes a friend to relearn how to drive after an accident, she sits in on a public speaking class, and cleans out her office because things don't equal memories. While her insights can help with any fear, I had hoped that this book might tackle some of the more nebulous fears - fear of confrontation or fear of failure, for example. Those are harder to write about perhaps, but I think those are the fears that really need to be acknowledged and discussed. At its heart, this book is about people coming together. Patty spends a lot of time with people who are afraid. She and the reader realize that everyone is afraid of something but our stories of triumph can help each other to overcome our fears. 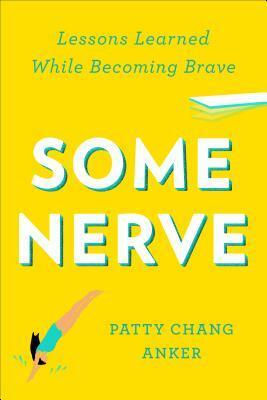 This book plays the role that Patty did for her daughters and her friends - an encouraging cheerleader, a reminder that fear does not have to dictate your choices and you are brave enough to face any challenge. Sounds similar to My Year With Eleanor by Noelle Hancock; she spent a year doing one thing she was afraid of every day...but best bits were the ones related to Eleanor Roosevelt and her life. It's a good read, but obviously not unique. I remember hearing about that one when it came out! Eleanor was such a fascinating person.